Treatment of cleft is surgical. Usually lip is operated between the age of 3 and 6 months and palate is operated between the age of 9 and 12 months. Important preparation before surgery is that the child should be thriving well, should be good weight for age and should not suffer from diarrhoea, vomiting, respiratory tract infections or any other illnesses. Surgery for the cleft lip- Lip is operated by various surgical techniques and their modifications. Common techniques are Millard’s or rotation advancement and Randall Tennison or triangular flap. Surgeons generally use various modifications of these common techniques to achieve good results depending upon the defect training and experience of the surgeon. Similarly bilateral lips are also operated by various techniques. Surgery for the palate- palate is generally operated by raising mucoperiosteal flaps and by separating the nasal layers . A good muscle dissection is also done under magnification to reconstruct the levator sling to achieve good functions of the palate. Suregery for alveolus- is usually done between the age of 6 years and 7.5 years. Surgery for the nose- nose is corrected at the time of lip repair, at the age of 7-9 years or after the age of 13 years. The hospital provides state of the art surgical treatment . Finest instrumentation and technique is use by the very experienced and well trained surgeons. The team is headed by Dr. Subodh Kumar Singh, world renowned cleft and plastic surgeon. - Cleft of the lip- clefts of the lip are operated between the age of 3 and 6 months. Anterior palate may also be operated at the same time. - Cleft of the both sides of lip ( bilateral cleft lip) are operated at the same time. 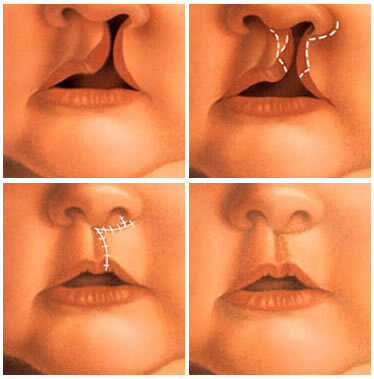 - Cleft of the palate is operated between the age of 9 and 12 months. - Fistula or hole in palate after cleft surgery- in rare occurrence of fistula after the cleft palate surgery, it can be again repaired by surgery, usually 6 months after the first surgery. - Clefts of gums or alveolus- A bone grafting is done between the age of 6 years and 7.5 years depending upon the growth of the teeth. - Correction of the nose deformity- corrective rhinoplasties are done between the age of 7 and 9 years and also after the age of 13 years if needed.